Today it is two weeks since my mom had her knee replaced. She is moving around pretty well on it. Thank you to her doctors, nurses and therapists who have helped the past couple weeks. You guys have been amazing! 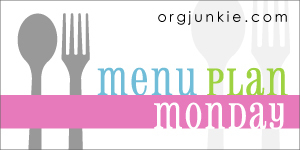 Check out Menu Plan Monday for more menu inspiration. I am hosting the Gluten Free Menu Swap this week and have picked rhubarb as the theme ingredient. If you would like to host a week of the swap, contact Cheryl at Gluten Free Goodness. She would love to hear from you! We have a boatload of rhubarb in the garden (which explains the theme!) so I plan on baking some rhubarb strussel muffins and hopefully putting up some sort of jam this week. Last year I also canned Sunshine Rhubarb Juice Concentrate and Spring Conserve which was pretty tasty, so I may do those again. I would also like to get a batch of Victorian Barbeque Sauce put up (a rhubarb based BBQ sauce). I’ll also freeze some for later use… What do you guys do with rhubarb? Got any great ideas? Great canning recipes? Do tell! I would love to hear what they are! Do you have more? Please share in the comments! -I am making a commitment to cook 2 times a week from other blogs I love or from the embarrassing number of cookbooks I own… Wish me luck! This is on Wendy’s menu – that’s good enough of a recommendation for me! Spicy Chicken with veggies over rice from Artisanal Gluten-Free Cookbook. I got this cookbook at the Gluten Free Culinary Summit this past October. I got to meet the writers, a really nice couple who’s blog is No Gluten, No Problem. -I am making a commitment to cook 2 times a week from other blogs I love or from the embarrassing number of cookbooks I own… Wish me luck! Braised Chicken with Shallots from Fresh Flavor Fast (adapted to be gluten free and made in the slow cooker) with mixed green salad. Saturday: Dance class for older daughter/greenhouse open house and field day at our CSA, Featherstone Farm. Woo! Heather at Celiac Family is heading into the busy spring time schedule. This is making her look toward lighter and quick meals for her family. Her menu looks delicious with Baked Salmon, Cilantro Lime Shrimp, Beef &amp; Veggie Kabobs and Chicken wit Mango-Heather will be hosting the menu swap next week with a picnic food theme. I am looking forward to that, as I am always on the lookout for portable meals with soccer and summer schedules coming up. Wendy at Celiacs in the House has play-by-play photos of a great gluten free paper mache viking helmet for PROM! I LOVE it! She also shares about having a GF meal at prom, which gives me hope for my kiddos at prom someday (okay, I don’t want to think of them going to prom just yet (gulp!) BUT yay for GF food hope!). She has Mexican Lasagna, Tofu Stir-Fry, Barbeque Beef and Beans, Spicy Chicken, and a pizza night planned. For her rhubarb recipe she will be making Jamie Oliver Rhubarb Souffles. Thanks for the rhubarb link to check out, Wendy! Cheryl at Gluten Free Goodness eats her rhubarb most often made into a compote with pineapple or apple (she says it freezes well, too). Yum! She has all sorts of great things growing in her garden, so spring must have sprung in her neck of the woods! Her menu includes chicken in parsley sauce, quinoa Italiana, and lentil dal with roasted cauliflower. She has a link to amazing looking gluten free, yeast free, egg free cinnamon rolls (she might be making them dairy free this week too!) from Cinnamon Quill that I just have to try. We have a new gluten free menu and blog to check out this week from Renee at Beyond Rice and Tofu. Her blog is gluten free and vegetarian and was started in April. It’s always so exciting to find other GF bloggers! She has a great post called “Where’s the Protein?” and a Thai Tomato Soup you need to check out. One her menu this week are Red Beans and Rice, Stir-Fried Tofu with Bok Choy, Greek Lentils and Pasta, and Egg Noodles with Vegetables. Yum! Thanks for joining us, Renee! wow, those are some amazing ideas for rhubarb! Love the idea of the ginger rhubarb compote, and I wish we could grow it here (too warm). Thanks for hosting, here’s mine! Thanks for hosting this week. Love all the links to the rhubarb recipes. I think I’ll have to try that rhubarb salsa. Hi Angela – Thanks for coming over to visit. I might be interested in this Gluten Free Menu Swap – have to check out Cheryl’s blog too. Although I am not always good with particular ingredients, esp rhubarb! I have never had it and wouldn’t know what to do with it. All I know is my mother makes a strawberry rhubarb pie for my stepfather. Gluten filled of course, so I have never tried it. But I will check things out. Thanks for inviting me. Nice to ‘meet’ you all! Thanks for adding me in! See you all next week!